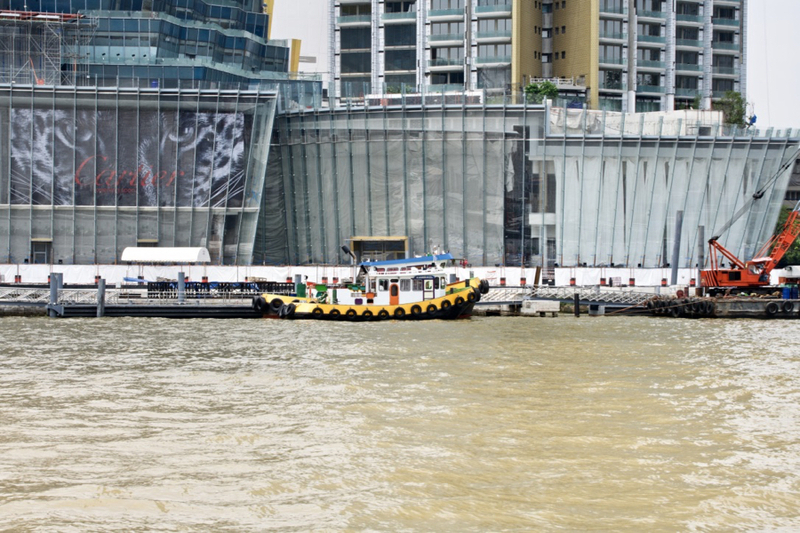 As construction of IconSiam nears completion, it appears that Apple has secured a prime riverside location for its presence in the mall, located along Charoen Nakhon Road and on the opposite bank of the river to CAT and the Oriental Hotel. I took some photographs at Wat Muang Khae, directly opposite. 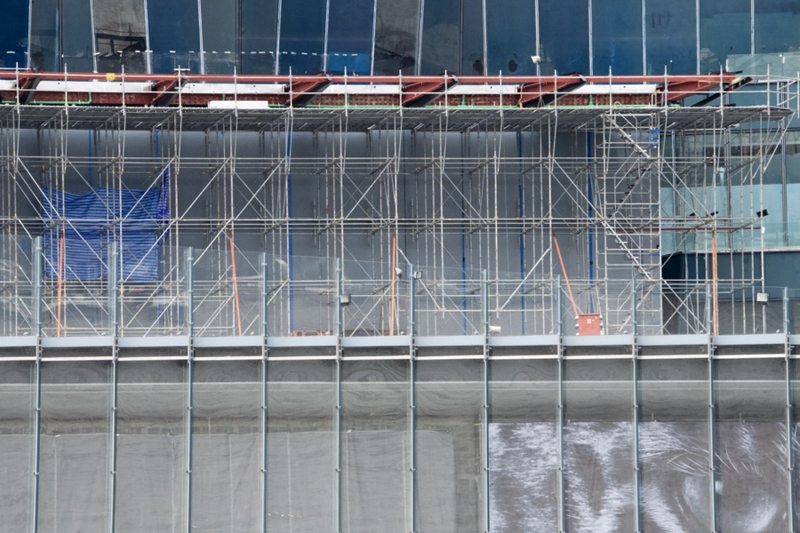 It was known that Apple had begun to recruit staff for its new store in Bangkok several months ago, but recently, construction outside the Central World mall, where Apple's country office is located had many convinced that this was to be the new store. 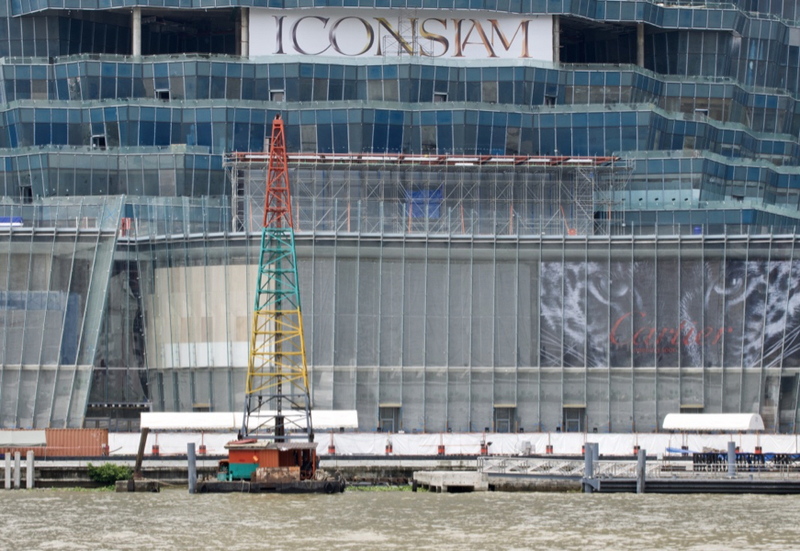 I was not wholly convinced (perhaps there will be two) and last week some images of the site at IconSiam were posted on Twitter, clearly showing an Apple icon. That was covered by a blue tarpaulin soon after, but there seems to be some confirmation that this is indeed where the long-awaited store will be. I realised that I had not taken the cameras out for 2 weeks, having been indisposed for the first week of that. 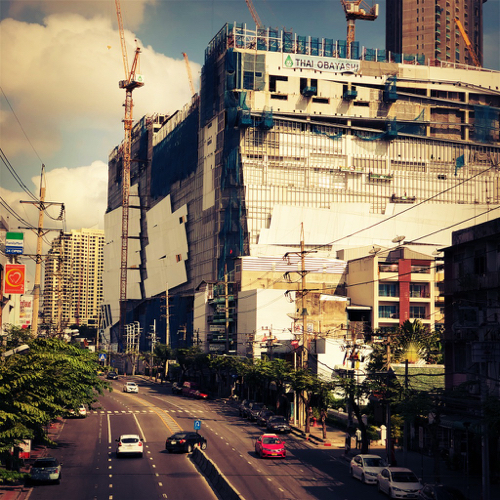 One of the tasks that had been on my list was a look at the expected site of the new Apple Store here in Bangkok. 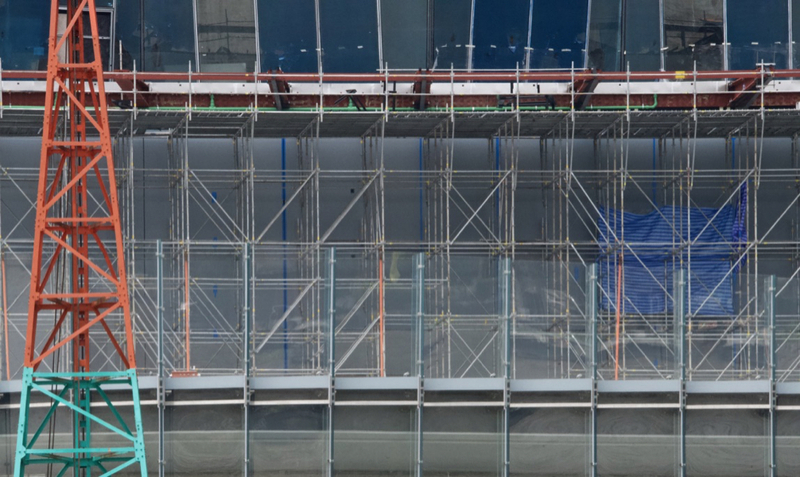 Long-rumoured to be located in the under-construction IconSiam mall. I had a walk past in January and put some photographs online, but there was not a lot to see back then. Since that time, I had bought a new camera and also picked up a Sigma telephoto lens (intended for wildlife shots). I wondered if using the lens I might be able to take some clearer images of the interior. In short, not really: the angle from the ground and the reflective windows limited what the camera could record. A closer look at the site gave me a number of ideas about what this store may be in the context of retail output that consumers have suffered in Bangkok for many years. Unusually, Apple will have reduced control of some design features, most notably the exterior glass. The choice of such materials is often significant for Apple. 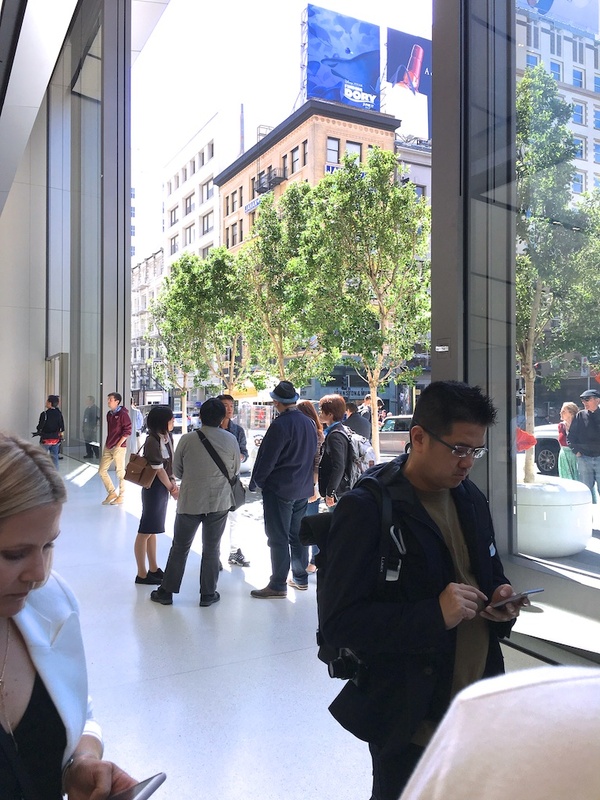 Notable examples include the New York store Cube, as well as the glass stairs, such as at the Union Square store in San Francisco where also the massive external doors were a main feature. 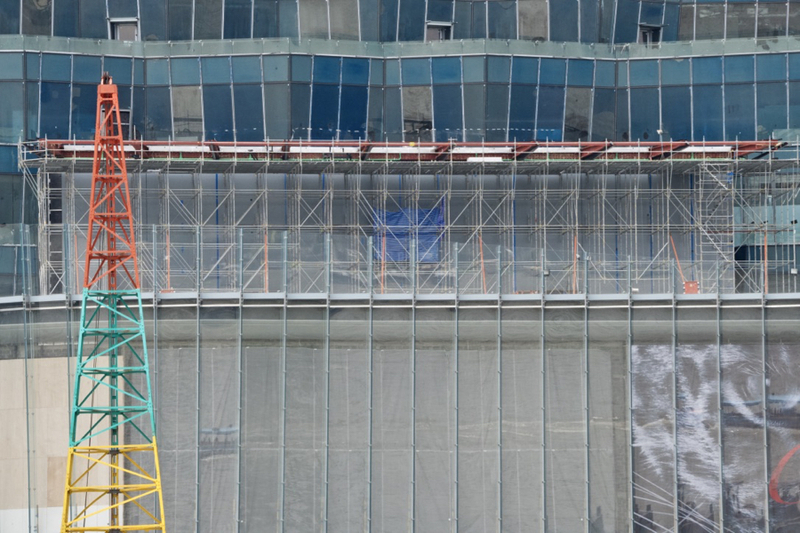 Unless Apple has forced its own designs of all of the riverside glass on Thai-Obayashi (and Siam Piwat), the company will be using what was designed by the architect of the complex. From my views of the frontage - this is visible from quite a distance - that greenish glass is nicely integrated into the overall design although construction equipment does detract slightly. The Apple store appears to be on the second floor, and I would expect that the ground floor will have several upmarket outlets (the photos show a large Cartier advertisement) and restaurants, with riverfront dining. That floor would have been less suitable for a retail outlet like the Apple store, so the 2nd floor location with a large river-side frontage represents a significantly large investment. Looking at the balcony area from Sathorn Bridge, there appears to be an estimated 15-20 metres available (more or less). 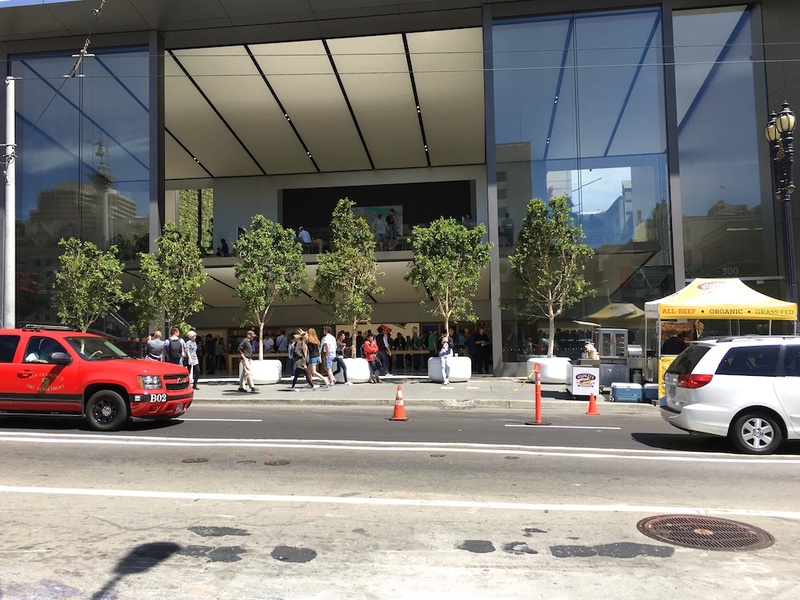 In line with other Apple stores worldwide that frontage can probably be opened, giving an area that could have several uses, from performance and education, or use as an area for relaxation. With the arrival of fittings, some of which can be seen from across the river, and the general condition of the rest of the new building, it is possible that a pre-Christmas opening might be anticipated. This could be expected to bring a number of Apple executives to Bangkok for the event, as well as many of the self-important Thai media who trip over each other at events like this and push themselves in everyone's way. When I first started following Apple here, the distribution system favoured a few small companies and a limited number of retail outlets that were not always consumer-friendly. The rejuvenation of Apple after the return of Steve Jobs trickled down to the street here and, although the same names were in the background, design of and pricing in the iStudio stores themselves were controlled by Apple. Initially, this seemed to work well for the consumer, but they are less vibrant these days. Products are not always in stock and it is often easier (and quicker) to order items online. 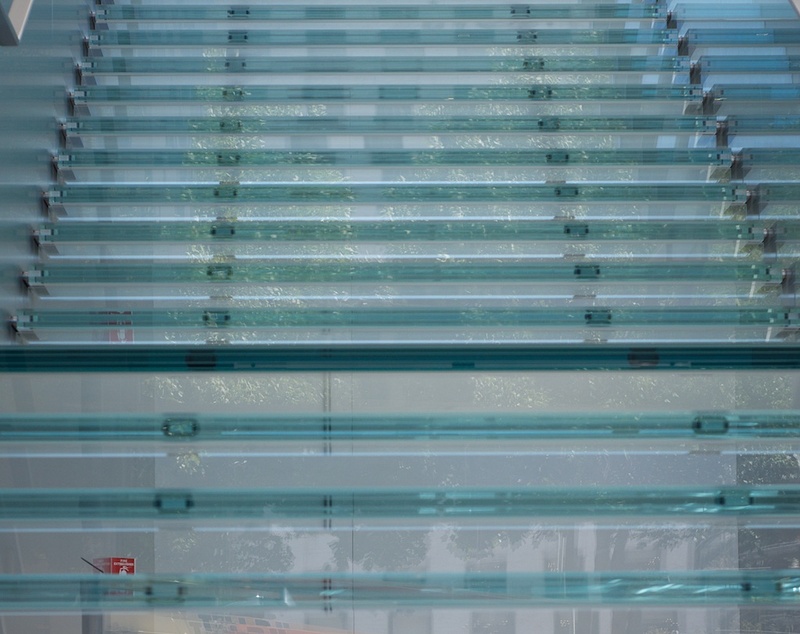 Whether the new store is to be a competitor, a flagship or part of a long-term strategy to improve Apple retail in Thailand is unknown outside the company. 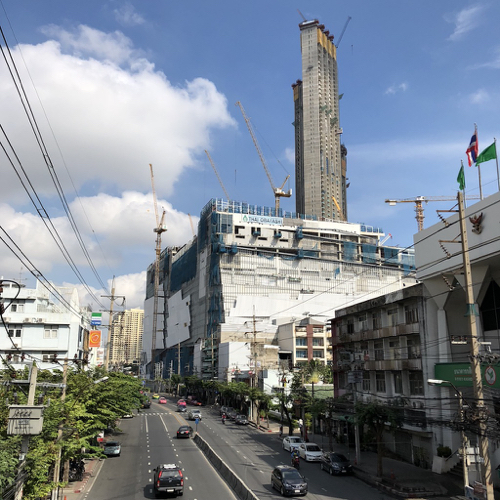 The area west of Bangkok has not been known as a retail powerhouse, particularly for luxury or high-priced items, but the investment of Siam Piwat may be an attempt to shift the balance. As the area has many 5-star hotels, the whole venture may be aimed at a different customer metric. That second construction outside Central World, has a couple of possibilities. Perhaps it really is the construction of an additional Apple Store, although its location puts it in competition with four iStudio outlets. Rather than competition it could be a high-priced showroom that would actually benefit the nearby retail stores, but this seems less likely. Also less likely is the idea that the construction is not specifically for Apple, but is for another of the franchise stores, perhaps with a designated purpose (such as duty-free sales). This is pure speculation on my part, but I am excited to see, after all these years, that Apple apparently intends to have a retail presence in Bangkok.